In as few as 45 minutes a child can be saved from a lifetime of pain, shame and isolation. You can give them a chance to go to school, make friends and have a bright future. 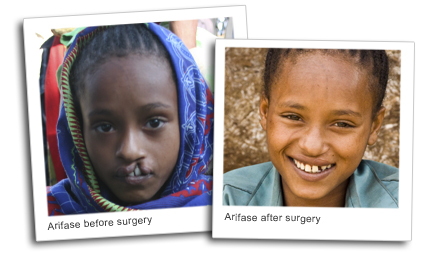 For as little as $240 you can provide a free surgery for a child suffering from cleft lip or cleft palate. "Habimana, 7, from Rwanda, used to be taunted and called "cleft boy" by his peers. After Operation Smile repaired his cleft lip, Habimana's life will never be the same. No longer teased and left out, Habimana now has friends, goes to school and has a future as bright as his new smile." Every 3 minutes a child is born with a cleft. We are helping children in need around the world. Surgeons are standing by to volunteer and provide free surgeries and train in-country doctors. Donate now. Help change the lives of other waiting children. Dedicate your gift in honor or in memory of a friend or loved one.